Kolbeinn Karlsson was born in 1982 and lives in Uppsala, Sweden. From 2006 to 2007 he was a student at Kvarnby School of Comic Arts in Malmö. During this time he self-published several mini-comics, which earned him a reputation as one of Sweden's most original cartoonists. His work has been published internationally in several magazines and anthologies, including Galago (Sweden), C'est Bon (Sweden), Glömp (Finland), Strapazin (Switzerland) and Kush (Latvia). He recently adapted The Troll King into an animated short film. 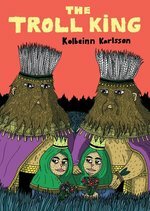 The Troll King is his first book.